This morning we had lots of rain. It was coming down pretty good. We’ve gone from rain, sunshine, to snow and all over again in the last couple of weeks. When we got back from Rochester this evening, and had our dinner, the barbershop guys came over. We haven’t had a chance to sing together for over a year now. So, we practiced a few songs and are preparing for a Family Home Evening the site missionaries are hosting in two weeks. We’ll sing a couple of songs, and then invite some of them to come join us to learn a song or two. We had birthday cake (because tomorrow is Elizabethe’s birthday) and sang happy birthday to Elizabethe. This entry was posted in Beckwith Mansion & Estate, Latter-day Saints, New York, Palmyra, New York, Rochester and tagged 2011, Beckwith Mansion, Brent, Brent Walton, Church, db walton, Elizabethe, Estate, Latter-day Saints, LDS, Missionaries, Monday, Mormon, New York, Palmyra, photographs, photography, Rochester, Snow, winter on February 28, 2011 by dbwaltonm. We had snow again today, but it was melting by the time we got out of church. Elizabethe came down with a bad headache today. We didn’t do much after church except for her resting and recovering. This entry was posted in Beckwith Mansion & Estate, Latter-day Saints, New York, Palmyra, New York and tagged 2011, Beckwith Mansion, Brent, Brent Walton, Church, db walton, Elizabethe, Estate, Latter-day Saints, LDS, Mormon, New York, photographs, photography, Snow, winter on February 27, 2011 by dbwaltonm. This entry was posted in Beckwith Mansion & Estate, New York, Palmyra, New York and tagged 2011, Beckwith Mansion, Brent, Brent Walton, db walton, Elizabethe, Estate, Main Street, New York, Palmyra, photographs, photography, Snow, winter on February 26, 2011 by dbwaltonm. Yesterday was such a nice sunny day. What happened? I got up this morning and it was barely snowing. 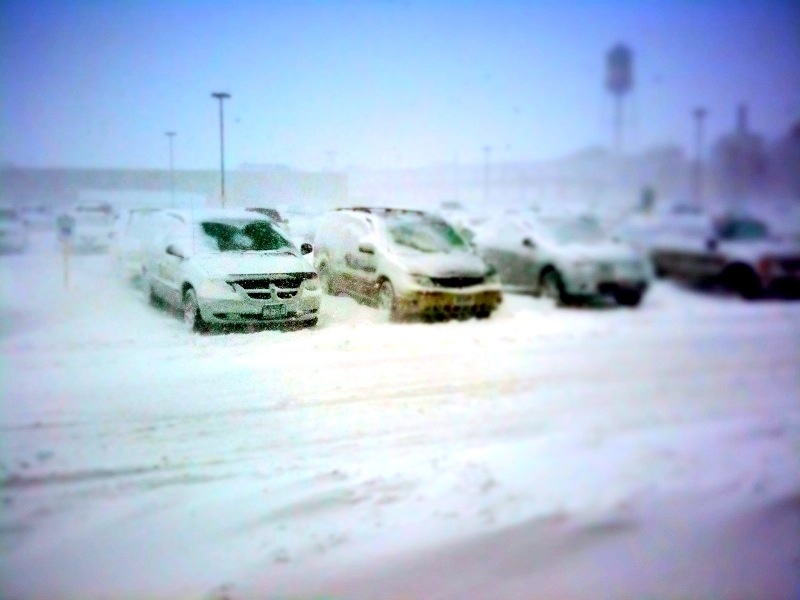 But, by the time I got to Rochetser, it was coming down like I have never seen before here. 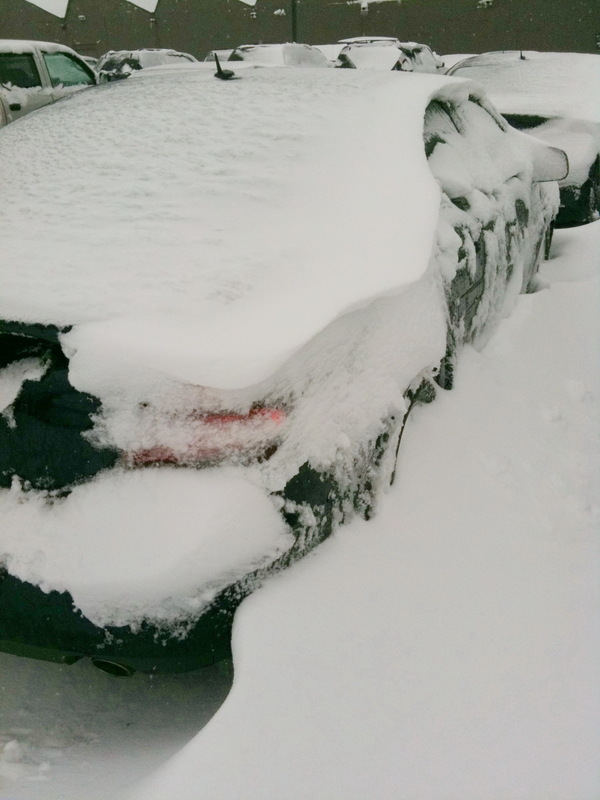 There was a snow drift between my car and the next. They say it is the most snow in the shortest amount of time we have got this season. Parking Lot at 400 West Ave. It was a nasty drive home, but by the time we got home, things were clearing up and snow was melting. We had dinner tonight at our bishop’s house. He home teaches us and the Hippens so the 6 of us had dinner together. It was fun and nice. This entry was posted in Beckwith Mansion & Estate, Latter-day Saints, New York, Palmyra, New York, Rochester and tagged 2011, Beckwith Mansion, Brent, Brent Walton, Church, db walton, Elizabethe, Estate, Latter-day Saints, LDS, Mormon, New York, Palmyra, photographs, photography, Rochester, Snow, winter on February 25, 2011 by dbwaltonm. It was a nice sunny day today. They say it is supposed to start snowing tomorrow, but you’d never know it from today. About 30% of the snow on the front lawn is melted. Where I’ve been shoveling the driveway, it is all melted too. This entry was posted in Beckwith Mansion & Estate, New York, Palmyra, New York, Rochester and tagged 2011, Beckwith Mansion, Brent, Brent Walton, db walton, Estate, New York, Palmyra, photographs, photography, Rochester, Snow, winter on February 24, 2011 by dbwaltonm. I find it odd that there are people wandering around in this country who still think “Mormons” are not “Christians”. What sort of rock do they hide under? Isn’t that odd that they would think that in these modern times when data and information is so readily available? And they accuse Latter-day Saints of having more scripture than just the Bible. A person who lives the teachings of Christ. A person who accepts Christ as the Son of God, the Savior of Mankind, their Redeemer, etc. Last time I attended a Mormon Church (which I do weekly), Christ’s atoning sacrifice was preached from the pulpit and we were encouraged to live more Christ-like lives. Hmmm… Martha West? Have you ever atteneded an L.D.S. Sacrament Meeting? In the end, it really doesn’t matter what West thinks about Mormons. There’s one way to find out if Mormons are Christians and that is to read the Book of Mormon. After all, that’s where the nickname comes from. So, my crock pot chicken, cheese, rice and broccoli casserole was a little on the pasty side. It was an experiment. The rice kind of turned to paste. But, I tried. This entry was posted in Beckwith Mansion & Estate, Latter-day Saints, New York, Palmyra, New York, Politics, Rochester and tagged 2011, Beckwith Mansion, Brent, Brent Walton, Church, db walton, Elizabethe, Latter-day Saints, LDS, Missionaries, Mormon, New York, Palmyra, photographs, photography, Rochester, winter on February 23, 2011 by dbwaltonm. After work we had training at the temple. It is currently closed and will re-open on 3/1. As that is a week away, they are conducting training all this week. Because we work on Tuesday night, it was our night to attend training. It was crisp and cold tonight. 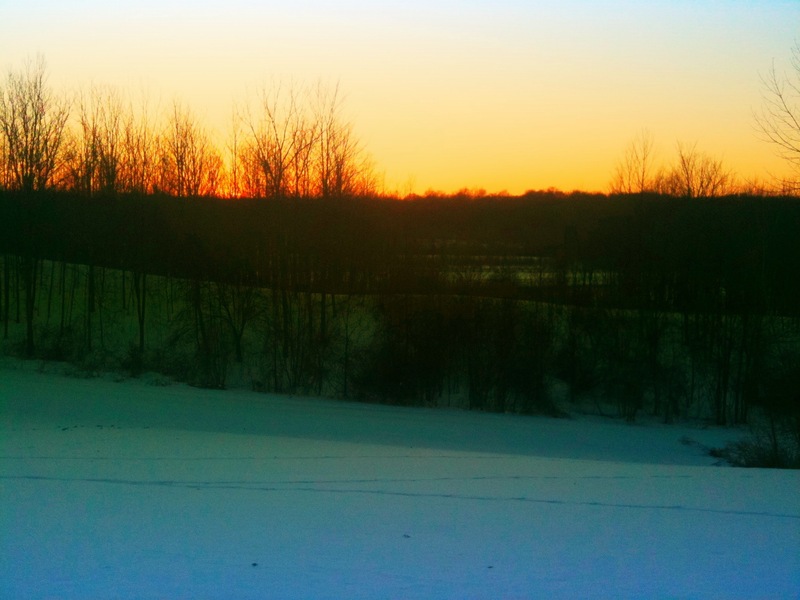 That made for a pretty sunset (as you can see – shot from behind the Palmyra Temple). It is ironic that they they cancelled the Curling on the Canal citing that the weather has been too warm. Those who have been watching my Season Watch page know we have had more snow days this year than we did last year. However, there is less ice on the canal. This entry was posted in Beckwith Mansion & Estate, Latter-day Saints, New York, Palmyra, New York, Rochester and tagged 2011, Beckwith Mansion, Brent, Brent Walton, Church, db walton, Elizabethe, Estate, LDS, Missionaries, Mormon, New York, photographs, photography, winter on February 22, 2011 by dbwaltonm. Ah, another Monday at work. Because it is a quasi-holiday, there were not many people in downtown Rochester or on the freeways. It made for a nice commute. But, it was still Monday. I managed to get the grocery shopping done during my lunch break. I figure it was cold enough outside that the perishables would keep in the car until we got home in the evening. And, I figured it wasn’t long enough that things would freeze solid before we got home. After work, Elizabethe and I headed to the Wildey’s. Heather invited us to dinner and we had a lovely evening visiting and playing with the kids. 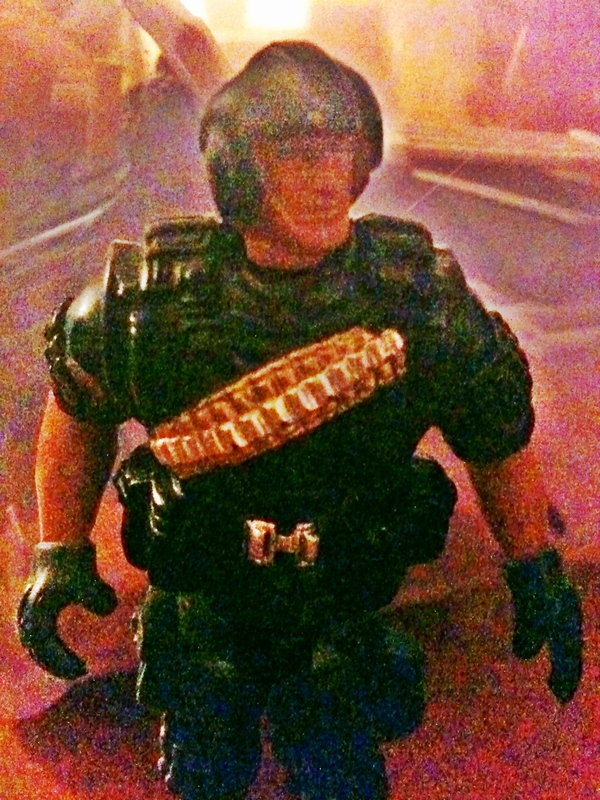 The above image was shot with my iPhone 3Gs of the Wildey boy’s little army man. Very low light, and then enhanced with a couple of iPhone apps. This entry was posted in Beckwith Mansion & Estate, Palmyra, New York, Rochester and tagged 2011, Beckwith Mansion, Brent, Brent Walton, Church, db walton, Elizabethe, Latter-day Saints, LDS, Monday, Mormon, New York, Palmyra, photographs, photography, Rochester, Snow, winter on February 21, 2011 by dbwaltonm. President Clark talked along with the Stake Relief Society President and Elder Cook, an area authority. After that, and a choir number, Elder Scott spoke to us. I was impressed that when the choir sang, Elder Scott left his seat and walked to the corner of the stand where he was out of people’s way, and turned to listen to and watch the choir. At the end of their singing, he gave them a big smile and a thumbs-up and he then took his seat. Truth be known, I was expecting a very somber but warm talk about repentance and forgiveness as that seems to be an underlining theme of his conference talks. Instead, Elder Scott was a bit more relaxed and down-to-earth than what I expected. His humility and love for the saints gathered there was quite evident. I loved when he said he would be meeting with President Monson on Thursday. He asked something to the effect, “By show of hands, how many of you would like me to go back and give him your love?” Seated on the stand where I could see out in to the congregation, every hand went up. What a wonderful conference it was. This entry was posted in Beckwith Mansion & Estate, Latter-day Saints, New York, Palmyra, New York and tagged 2011, Beckwith Mansion, Brent, Brent Walton, Church, db walton, Elizabethe, Estate, Latter-day Saints, LDS, Missionaries, Mormon, New York, Palmyra, photographs, photography, Snow, Sunday, Temple, winter on February 20, 2011 by dbwaltonm. We started the day off by going to the Bishop’s Storehouse for a ward assignment. 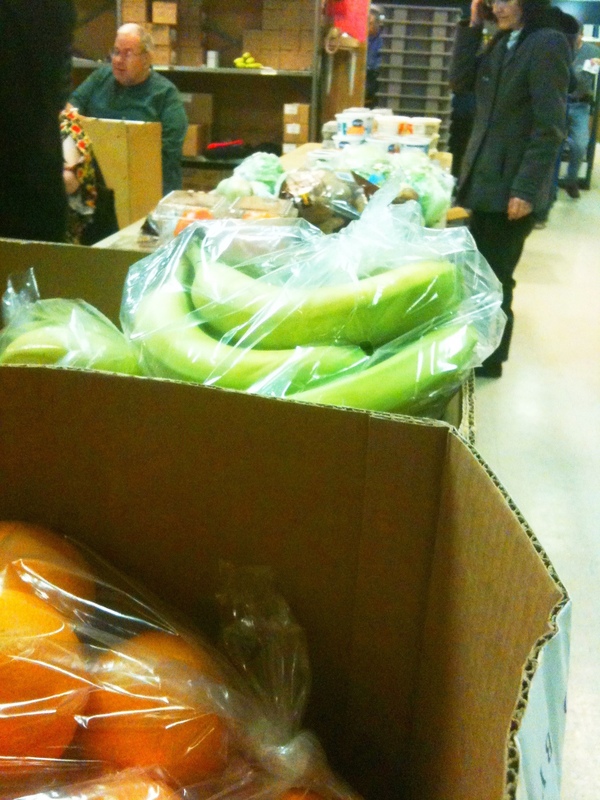 Elizabethe and I helped with the bagging of frozen food and produce to be shipped all over the area. I was stationed at a table with lettuce, celery, apples, bananas, oranges, grapefruit, potatoes, onions and tomatoes. Someone would call out a bag number, Elizabethe would write the number on the bag, and then the caller would call out what goes in that bag. “L-19. 2 lettuce, 1 celery, and a bag of onions,” the caller would say. I would pickup those items, while someone on the other side of the table held bag L19 open so I could place the items in them. The bag would then be tied shut and placed in a bin tagged “L” destined for Lancaster. We were done in about 2 hours. The bins we filled were loaded on to a truck so they could be transported to their various destinations in the area. So, what does this have to to do with taxes? After we got done, we returned home and Elizabethe and I worked on our 2010 taxes. You know, it is sure a pain. If we had a flat-tax system with no deductions allowed, imagine how easy taxes would be? This entry was posted in Beckwith Mansion & Estate, Latter-day Saints, New York, Palmyra, New York and tagged 2011, Beckwith Mansion, Brent, Brent Walton, Church, db walton, Elizabethe, Estate, Latter-day Saints, LDS, Mormon, New York, photographs, photography, Snow, winter on February 19, 2011 by dbwaltonm.